I'm a big fan of redundancy lately, much like the title of this post. The surprise mentioned was a package I received a few weeks ago, just as we headed out of town for my alumni game, from Pear Tree Greetings. I was emailed a few months back about a program Pear Tree offered and I agreed to sign up . . . promptly 6 months later I'm finally acting on the opportunity. Basically the reason why is the package I recieved! It was chock full of their new 2010 Holiday Card design samples. I'm so excited to share this company with you guys and definitely think you should take a look. This stuff is quality and they have 100's of new designs this year. 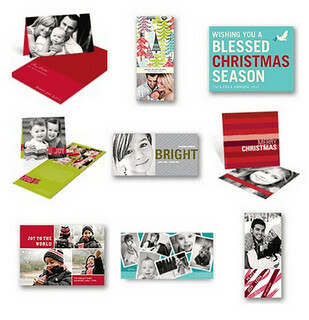 Basically Pear Tree Greetings offers every sort of paper good one could ever imagine, and their Holiday collection is no exception. Some of my favorites included a snowman thank you card and folded personalized photo card. But you really should check out all of their Christmas cards and thank you cards. The quality is just crazy, as each card is heavy 100 lb matte card stock, which is also 100% post-consumer recycled! I'm really looking forward to ordering my Christmas cards with Pear Tree, because they boast a 4-9 business day turnaround, including 2 days of processing time. I look forward to offering some giveaways and discounts to Pear Tree Greetings and hope this helped some one cross a to-do off their list! I just received some lovely new address labels, as a housewarming gift. They were from Pear tree, I love their store!! I am so super excited to explore their website:) Thanks for the reminder! !